--MR16 energy saving LED bulbs are designed for domestic, commercial and retail lighting, and are a direct replacement for existing GU10 halogen bulbs. --Use single super bright LED light source, with remarkable energy-saving effect. --Perfect for home, living room, bedroom, Dining room, hallway, kitchen, office, studio, restaurant, hotel, library, KTV, meeting room, show room, shop window and many other application lighting and so on...Maintenance Free, Easy for installation. --MR16 energy saving SMD LED bulbs are designed for domestic, commercial place, retail lighting, and are a direct replacement for existing GU5.3 halogen bulbs. While MR16 require DC 12V driver. 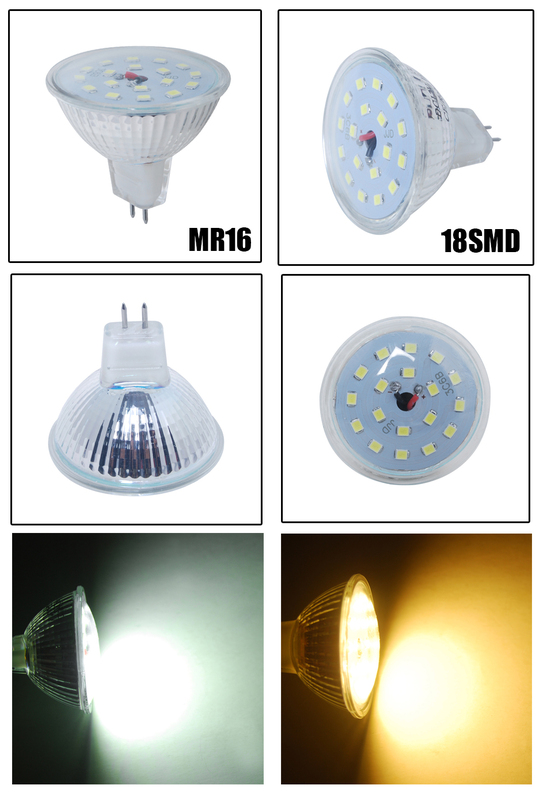 --MR16 bulbs feature High Power SMD LEDs (highest quality chip) with a clear glass shell which produces a great light output. High energy-saving: Saves 70-90% of electrical energy compared with incandescent lamp. Long lifespan: Above 50, 000 hours. Lower temperature: The light emitted would not produce much heat no matter how long it was used. Healthy light: No ultraviolet and infrared radiation . Environmental protection: No any chemicals like mercury and lead, easily recycled, no electromagnetic disturbance. Please be extremely carefully to choose as only GU10 can be used in Halogen transformer while MR16 cannot. If you use MR 16 in your Halogen transformer, the bulbs would burn out, our MR16 need DC12V LED driver or please contact us more information before ordered. RECEIVED TODAY EXCELLENT SERVICE THANK YOU . Brighter than the halogen bulb. Visually, a cleaner looking light than the orangey coloured halogen. Fit the kitchen ceiling spotlight without any issues. Obviously, my photograph taken with a phone camera will not show the light output very accurately, it is primarily to show the fit as I gather some led bulbs aren't a very good replacement in terms of fit. Great replacement for normal MR10 bulbs. These came well packaged in a large box, with each bulb individually boxed and in plastic. They could probably package these without so much packaging. They fitted as expected. The colour is much whiter than what they replaced but I expected that having purchased other types of LED bulbs, great for the kitchen or bathroom. I would definitely buy again. LUMENS. It's all about the Lumens - how brightly the bulb shines. I've used other bulbs in the past and they've put out an underwhelming amount of light. Excellent quality mirror light, needed something for a rather dark bathroom and this does the job perfectly. Chose the white as opposed to the warm white because the reviews said this was a brighter light and that the warm white was more for lighting above a picture etc. Very pleased with purchased arrived earlier than the date given and was excellent value. Excellent wide beam lights. Used in a 6 x Way fitting for a kitchen. Gives great coverage.